The Adirondack Rail Trail | Explore. Learn. Delight in nature. Explore. Learn. Delight in nature. The Adirondack Railroad once connected Utica and Lake Placid. Completed in 1892, this train through the Adirondack wilderness opened the region to a surge of tourists, health seekers and seasonal residents. Regular rail service on the line ended decades ago, and we now have the opportunity to convert the first 34 miles of this historic corridor into one of the nation's premier, year-round recreation trails for bicyclists, runners, walkers, birders, wheelchair users, and for greatly improved snowmobiling from December through March. The trail will serve young families, senior citizens, commuters, and long-distance adventurers. It will enable residents and visitors of all ages and physical abilities to enjoy safe, healthful exercise, commune with nature, and soak up Adirondack history. All this in a peaceful, safe, scenic setting along a path with no more than a 2% grade! The trail breaks into two distinct segments: 34 miles from Lake Placid to Tupper Lake, passing through the Villages of Ray Brook, Saranac Lake and Lake CLear, then 56 more miles through Adirondack Wilderness to Old Forge The first 34 miles that will be suitable for road bikes passes many access and egress points as well as many amenities. The NY Department of Environmental Conservation is responsible for the construction of the trail. Meetings with community stakeholders are underway to prepare for a comprehensive plan that the public can comment on by early 2017. 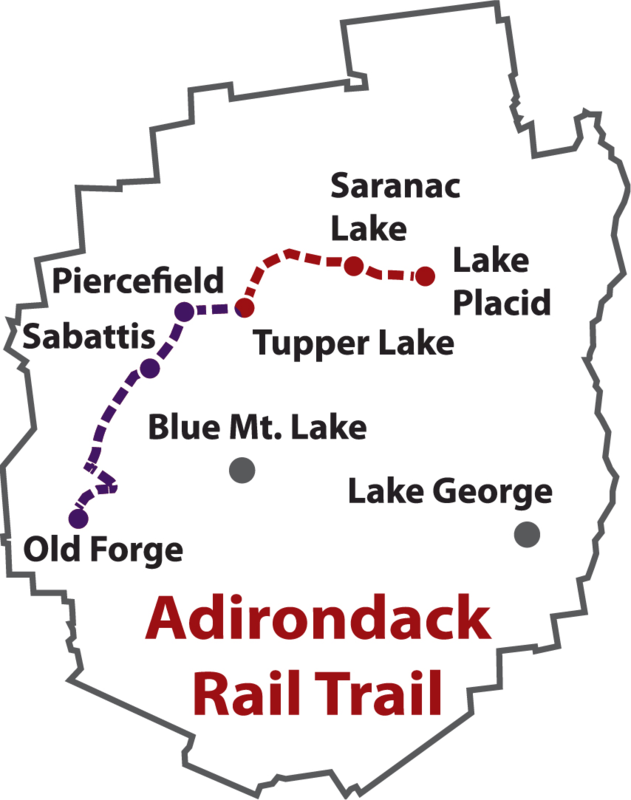 The Adirondack Rail Trail will preserve the history of a railroad that made access to the interior of the Park possible, hauled minerals and timber to distribution centers, allowed wealthy landowners to develop and visit their properties, and transported thousands of people sick with tuberculosis and their loved ones to Saranac Lake for treatment.